The American middle class may be on its way to extinction (we’ll see how much faster in the November elections - and you might remain a few months longer with your company if you learn Mandarin Chinese and can train your own replacements after the CEO outsources your job). But those middle-management and manufacturing folks were preceded into oblivion by a number of animal species, who were also exterminated ruthlessly, usually to satisfy market demands. 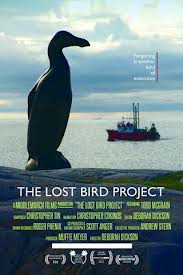 THE LOST BIRD PROJECT is an offbeat hybrid of art documentary and nature film that depicts a sculptor named Todd McGrain in an effort to memorialize several vanished bird species. McGrain, inspired by Christopher Cokinos’ book Hope is a Thing With Feathers, consulted with naturalists and ornithologists, and undertaken five larger-than-life metal-poured replicas, to be placed on display in the wildlife areas in which the last specimens of the birds were seen alive. And, yes, there is an Ohio connection. It was in a field not far from Cincinnati that an Ohio farm kid shot the last wild passenger pigeon in 1900. Maybe Gov. Kasich can push for this state to get some pork-barrel stimulus money to erect the Extinct Species Hall of Fame and Museum. The one-hour film, unlike the preceding sentence, is notably vacant of eco-anger and cynical misanthropy. Director Deborah Dickson’s understated style still conveys plenty of melancholy, as McGrain’s trek gradually leads us into the sad sagas of the decline and deaths of the Carolina parakeet (last living one gone by 1918), the heath hen (last one, actually a regional celebrity, died vainly calling for a mate in 1929 on Martha’s Vineyard), the Labrador duck, the great auk and more. We hear of the 19-century craze for women’s hats with actual mounted dead birds on them (Lady Gaga would approve) that resulted in countless avian corpses. A trick that enabled hunters to gun down passenger pigeons by the thousands gave common vernacular the term “stool pigeon.” No, the spectacular ivory-billed woodpecker – an animal whose fate was chronicled in another recent feature, GHOST BIRD - is not among the memorials. McGrain progresses with his sculpture installations, even when (as with the passenger pigeon) he’s not satisfied with the emotional vibe/resonance of the historic death scenes. Or, as with the heath hen, parks administrators are cool to his proposal. But he does meet a number of rangers, naturalists, Indians and just-plain folks who “get” exactly what he’s trying to accomplish, in using the past to try to warn the present, and creating something meaningful out of mankind’s endless capacity for mindless destruction.